Lancashire, Yorkshire and Greater Manchester – Other areas by enquiry. Next day steel delivery is possible on most orders for delivery to Lancashire, Yorkshire, Manchester, Cheshire. Deliveries or carriage to other areas of the UK can be arranged with the sales team. Delivery is free of charge, all our product is covered and protected against wet weather. 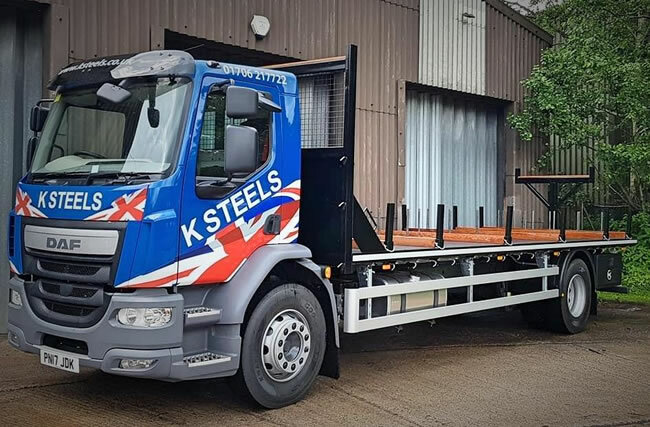 Our fleet of over 14 dedicated K Steels flat bed lorries have experienced and helpful drivers dispatching from two warehouse sites in the North of England. This allows for a wide range of delivery options to suit your needs. Constant upgrades to our fleet ensure that our vehicles are fuel efficient and reliable. Collection is possible between 9.15 am and 4pm. 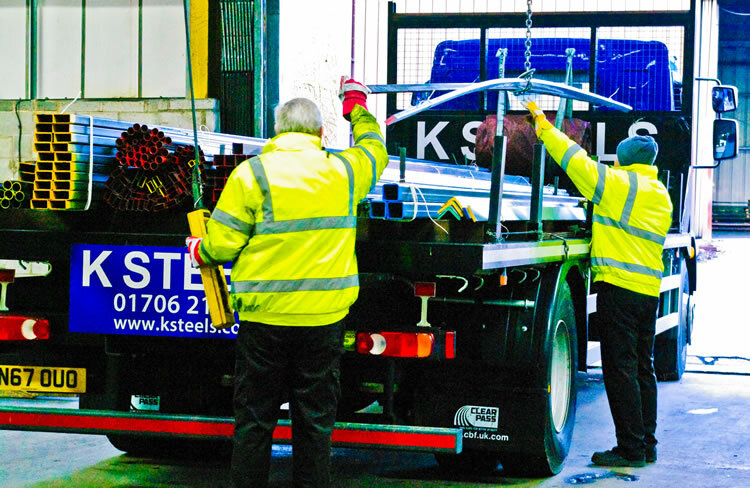 If you require your steel immediately then collections are available from both K Steels sites and can be arranged when you place your order. Office hours 8am – 5pm Monday to Thursday, 8am to 4pm on Fridays. From M62/ M60 – Take the exit for the M66 Signposted ‘Bury’. Continue along the M66 until it becomes the A56. Keep to the right and the road becomes the A682. At the second roundabout go all the way round – taking the final exit before the A56 for Bury Road – signposted ‘Edenfield’. Take the second right into Holme Lane , turn immediately left after the level crossing – continue straight on to K Steels. Approx 300 metres Go under railway bridge turn left onto private road – follow road around to the right of the main entrance.